Thoroughly updated and revised, Network and Discrete Location: Models, Algorithms, and Applications, Second Edition remains the go-to guide on facility location modeling. The book offers a unique introduction to methodological tools for solving location models and provides insight into when each approach is useful and what information can be obtained. 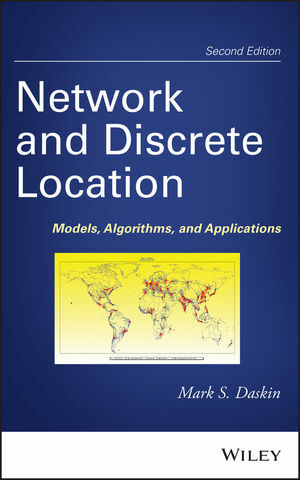 Network and Discrete Location: Models, Algorithms, and Applications, Second Edition is an essential resource for practitioners in applied and discrete mathematics, operations research, industrial engineering, and quantitative geography. The book is also a useful textbook for upper-level undergraduate, graduate, and MBA courses. MARK S. DASKIN, PhD, is Clyde W. Johnson Collegiate Professor of Industrial and Operations Engineering as well as Department Chair at the University of Michigan. Dr. Daskin is the former editor-in-chief of both Transportation Science and IIE Transactions and continues to serve on the editorial boards of both journals. He is also on the editorial board of the IIE Transactions on Healthcare Systems Engineering and is the author of the award-winning book Service Science, also published by Wiley. All referenced files may be found at http://umich.edu/~msdaskin/discretelocation.